The manufacturing landscape is undergoing a massive shift. Consumer demands, the nature of products, and the economics of production and distribution are all evolving. Manufacturing used to be about making physical products. Today, however, changes in consumer demand, the nature of products, the economics of production, and the economics of the value chain have led to major shifts in the way goods are designed, produced, and sold. To succeed in this new landscape, manufacturers must find new ways to create and capture value. This report explores how exponential technological advancement, coupled with eroding barriers to entry, commercialization, and learning, are creating a new business landscape. While large-scale production will always dominate some segments of the value chain, innovative models—distributed small-scale local manufacturing, loosely coupled manufacturing ecosystems, and agile manufacturing—are enabling small players to enter markets once the province of large incumbents. There is no single path to success. 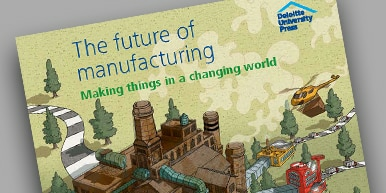 Rather, this comprehensive report from Deloitte’s Center for the Edge offers a set of pointers and guideposts to help you define your own success and blaze your own trail through this new and exciting manufacturing landscape.